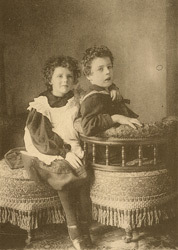 "'Ada and Bertie' (F. Harman Orr - Bronze Medal). The placing of the awards in this competition, we remember, gave rise to some discussion, which we published in our correspondence columns at the time. We have already, in our prefatory remarks, explained the manner in which the awards are arrived at; and we would only remark that our critics are at a disadvantage in having to form their opinions on the half-tone block illustrations, and not upon the prints themselves. We have recently again looked through the successful prints in this competition, and we see no reason to alter our original opinion in regard to their relative merits. The bronze medal picture, against which the criticism was directed, is a charming little study, the pose natural and easy, and the modelling of the features, particularly in the case of the girl, admirable."